There have been many studies that have proven the benefits of adding strength training to your daily workout routine. Lifting weights including adjustable dumbells, in particular, benefit your heart, increases bone strength, improves your balance, and aids greatly in weight loss. Adjustable dumbbells allow you to use a variety of plates that attach to metal bars in order to achieve your desired weight. This is an effective and economical solution to adding lifting to your everyday workout. You could purchase an expensive piece of gym equipment that works only one or two parts of your body to get this beneficial workout, or get one of these adjustable dumbbells as a much more affordable option instead. Cost Effective: Many athletes buy expensive gym memberships or invest thousands of dollars into home gym equipment to achieve their desired lifting results. With adjustable dumbbells, you can achieve these same results at a fraction of the cost. Simply purchase the starter kit and purchase separate weight plates as needed. The cost is much lower than going to the gym and your results will be just as good. Customizable: Adjustable dumbbells allow you to customize your lifting weight depending on your comfort level. Gone are the days of having 15 different sets of dumbbells, all at different weights. With adjustable dumbbells, you have one set of bars and several plate sizes that are customizable for every workout. Convenient: There is something to be said for being able to work out in the comfort of your own home, and adjustable dumbbells bring this possibility to the average individual. Set up these weights in your basement, living room, or office space. They take up so little room that they won't be an inconvenience when not in use. You could even get a few reps in during the commercials of your favorite TV show! When purchasing a set of adjustable dumbbells, there are several things that you should consider before making your final decision. A new research found the 10 Most Fat Torching Dumbbell Exercises. Overall size, cost, weight, and quality should be at the top of your consideration list. Besides, you should think about things such as ease of adjustment, storage, and the warranty that the product has to offer. Making an educated decision is crucial to invest your money in a high-quality product that will be useful for your needs. The size of your adjustable dumbbell set should be one of the first considerations you think about when making your purchase. There are professional lifting sets that offer a wide variety of plates and handlebars to increase the amount of choice you have in a workout. While these might seem tempting, remember that you have to store this piece of equipment in your home or office when it’s not in use. Choose a set that will have the weight you desire but will also store easily. There are three major categories of adjustable dumbbells from which you can choose when purchasing your set. Dial-a-weight dumbbell sets, spin-lock adjustable sets, and selector pin varieties all offer different features to you as the user as you search for your perfect lifting workout. Dial-a-weight: This type of adjustable dumbbell features a dial that allows you to select the amount of weight that you wish to lift. Once you select the correct amount of weight, simply lift the barbells and whatever weight amount that you chose will be attached to each end. The remaining plates will be conveniently left in the holder. These are very convenient but can be the most expensive variety of adjustable dumbbells. Spin-lock: This type of adjustable dumbbell is the most traditional variety and features multiple weight plates that are held together with a spinning lock. You manually put the amount of weight that you want on each end of the weights and hold them in place by twisting the metal lock until it is tight. Although this may be more cumbersome than the convenient dial-a-weight variety, they are much more affordable. Most adjustable dumbbells have a maximum weight around fifty pounds per weight, or a one hundred pound total weight. You can purchase heavier or lighter sets; however, so it is important to make sure you are considering the right range. Don't just think about how much weight you can lift right now. Remember, you are going to be getting stronger so you want a dumbbell set that can grow with you. Adjustable dumbbells are beneficial in part because they allow small adjustments in weight increments all in one piece of equipment. Make sure that the dumbbell set you are considering allows for both small and large weight adjustments. If you pick a set that only allows adjustments of twenty pounds, you will be out of luck when the weight that you are currently lifting is too little but twenty pounds heavier is too much. Most adjustable dumbbells come in 5, 2.5, or 1.5-pound increments so make sure to choose the right set for your fitness needs. As mentioned above, there are three major types of adjustable dumbbells from which you can choose. The easiest to adjust are the dial-a-weight systems and pin lock varieties. Though you may pay more money for these, they will make your workout a breeze in terms of changing weights. If you are on a tight budget, you can choose a spin lock variety but just be aware that it takes a few minutes to change out the weights. Make sure that you decide on an adjustable dumbbell set that you will use. If paying a few extra dollars means that you will use the equipment more, then go with the easier to adjust variety. The more intricate that your adjustable dumbbell set is the more likely it is to cost a significant amount of money. You will be investing a few hundred dollars into this piece of equipment but make sure that you aren't purchasing weight plates or a storage system that you don't actually need. Make sure to balance quality with affordability when considering your adjustable dumbbell purchase. You want to pick a brand of dumbbells that is of high quality so that you know that you will get a reliable and safe workout each time you use them. With that being said, however, if two brands are similar in their offerings and have similar user ratings it might make sense to save a few dollars and invest in the less expensive version. Make sure to review things like the quality of the dumbbells, stand, and customer service before making your final decision. There are several ways to store your adjustable dumbbells that should be considered before you make your final purchase. Some varieties come with a stand for easy and convenient storage while others do not. Those models that come with a stand are going to be more expensive but provide a simple way to store your exercise equipment when not in use. This might be perfect if you are working out in a small space that isn't designated as a home gym. Adjustable dumbbells that don't come with a stand for storage are going to be less expensive, but they will be more cumbersome to store when not in use. Choose this variety if you have a basement or home gym in which you wouldn't mind them being on the floor for storage. Finally, you should always consider the warranty offered on any piece of exercise equipment that you are considering, including adjustable dumbbells. Warranties offer extra protection in case of an unintended malfunction of your product. Ask about the product warranty, parts warranty, and labor warranty to make sure that you are covered in the case of an equipment malfunction. There are many models of adjustable dumbbells on the market today each with specific advantages and disadvantages that might make them the perfect purchase for your needs. This adjustable dumbbell set features a heavy duty construction and weights that adjust from 5 to 75 pounds in 2.5-pound increments. This version is priced at $529 and is available with an accompanying stand. It is important to note, however, that you can purchase a 45 pound set of adjustable dumbbells by this same brand with no stand for around $340. One of the advantages to the Ironmaster adjustable dumbbells is the quick lock adjustment system. While some dumbbells take several minutes to adjust the weight, this brand can be adjusted in less than 15 seconds. Another advantage to this product is the flexibility with the amount of weight you use. As mentioned before, you can purchase a 75 pound or 45-pound set. You can also purchase an add-on kit to increase the weight of this product to 120 pounds if desired. Some individuals have mentioned that the weights on this product can be less secure at 75 pounds due to the fewer overlapping threads. Make sure that your weight is secure before starting any exercise routine to avoid any injury. Overall, this set of adjustable dumbbells is an affordable investment that will keep you in shape while in the comfort of your own home. The quick lock technology makes changing weight plates a breeze and you can also purchase additional weight for your fitness needs. Just make sure to tighten the pins carefully before starting your workout to avoid any loose plates while you lift. This set of adjustable dumbbells replaces purchasing sixteen separate sets of dumbbells for your workout. With a maximum weight ranging from 50-130 pounds (depending on whether you buy additional weight) these adjustable weights will supply everything you need to meet your fitness goals. This product also features a 10-year warranty if used in the home. These dumbbells are priced at $299-$599, depending on the amount of weight you desire. Many customers liked the selector pin system which adjusts the weight on this brand of dumbbell. They said that it was easy to use and similar to the weight machines at a gym, which led to confidence when using the equipment. Also, the durable material that this product is made out of is a huge advantage. You will likely be using this product several times each week, and it is important that it can stand up to the type of workout that you will complete. The PowerBlock brand is designed for toughness and will hold up to the most challenging circumstances. One of the disadvantages to this product that several customers mentioned was the fact that the weights go up in 10-pound increments after the first 5 pounds. This might be too great of an increase for some individuals. Make sure to double check the model that you are purchasing, as there are models of PowerBlock weights that increase weight in small increments. Another possible disadvantage is the fact that they are hard to send back to the manufacturer in the case of a malfunction, due to their size. The PowerBlock Elite Adjustable Dumbbell Set is a versatile set of weights that can be adapted for many users' needs. Its pin system makes it very easy to change the weights while its range of products also allows for you to expand your workout weight when desired. Make sure that you read product descriptions carefully before purchasing, however, to ensure that you are purchasing the product with the appropriate weight for your needs. This dial-a-weight adjustable system adjusts from 4 to 45 pounds in 5-pound increments at the touch of a dial. This product features a no-slip grip on the handles of the dumbbells for added safety, a space-saving storage shelf, and a comprehensive workout guide to ensure that you are getting the most effective workout possible. These dumbbells are priced at around less than $300 and have the option for purchasing a workout bench for $100 additional cost. Just twist and go! 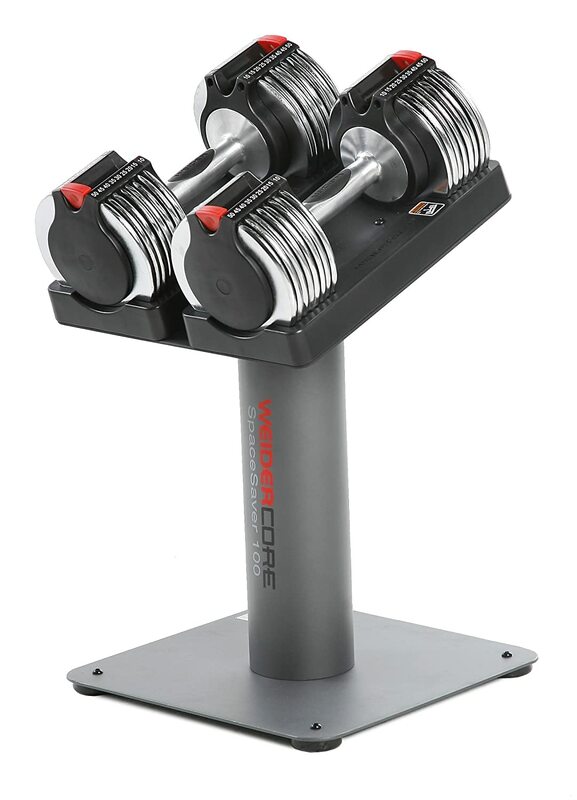 Finally, the dumbbells and stand carry a one year warranty which should give you confidence in the product's quality. Though there are many advantages to this set of dumbbells, there are a few disadvantages that are worth noting. First, these weights have a maximum weight of only 45 pounds, whereas some other models may go much higher. If you are looking for a heavier amount of weight, you might want to explore other options. Secondly, there are only nine weight settings, which may provide limited lifting options. The Universal Power-Pak adjustable dumbbell set is a good option if you are looking to lift a low to moderate amount of weight. Its dial-a-weight system makes changing weights a breeze and it is by far one of the most affordable products on the market. The only major downfall is the fact that these weights do only go up to a 45-pound maximum, which might not be enough for some users. This brand of dumbbells is one of the best selling in the United Sates, and for good reason. With features like the adjustable weight from 5-52.5 pounds in 2.5-pound increments, or 10-90 pounds in 5-pound increment, you will be sure to get the workout you desire by purchasing this product. These weights feature a dial-a-weight system which allows you to conveniently and quickly turn a dial to select the amount of weight you wish to lift. The 52.5-pound max weights are priced at $299 for the set while the 90-pound max weights are priced at $276 for a single weight. Some of the pros to the Bowflex SelectTech adjustable dumbbells include their weight versatility, pricing options, and accompanying workout aides. With 15 different settings for each dumbbell, you will have a wide variety of weight options from which to lift. In addition, though the price isn't the cheapest on the market, Bowflex offers you the opportunity to just purchase a single dumbbell as opposed to a set. This could cut down on the cost of your purchase and could be just as effective, especially if you are lifting a heavier weight. Finally, there is a comprehensive workout DVD that accompanies this purchase so you can be sure you are lifting in the most effective and safe manner.<i>Cons</i>: There have been a few customers who have commented on the fact that the weight plates occasionally catch or don't feel 100% secure when they are lifting. Make sure to check with customer service for your specific situation. After reviewing this product, it is clear that it is made of high quality and is adaptable for many different workout situations. The wide variety of weights that each set can be adjusted to makes this product perfect for the beginner or the advanced athlete. Be aware of how tightly your plates are positioned in the dumbbells, however, to avoid potential injury and make sure to read the warranty carefully before making your final purchase. This product features the option to purchase a pair of 25-pound maximum weight dumbbells, a pair of 50-pound dumbbells, or a single 50-pound dumbbell. Each option includes a simple adjustment knob to lock in your desired weight and heavy-duty chrome plated steel construction. The minimum weight on the 25-pound max weight dumbbell sets is 5 pounds while the minimum weight on the 50-pound max weight dumbbells is 10 pounds. One of the advantages to the Xmark adjustable dumbbells includes the option to purchase a single dumbbell if desired. Many individuals will only lift a higher amount of weight one at a time, so this is a great way to save a hundred dollars while still maintaining your high-quality level of workout. In addition, the durability of the product is another advantage. Many individuals have claimed that similar products have broken when having been dropped on the ground, but the steel construction of the Xmark dumbbells prevents any damage from occurring. One of the major disadvantages to this product, as stated by several customers, is the fact that they only adjust in 10-pound increments. While many products adjust in 5 or even 2.5-pound increments, users might find that the 10-pound gap might be too large for their fitness level. In addition, some users have mentioned that it is difficult to secure the weight plates onto the product when adjusting the knob. Make sure that your weight plates are secure before beginning any workout to ensure your safety. After reviewing this product it is clear that it is an affordable choice if you are looking to lift no more than 50 pounds with each dumbbell. One concerning factor, however, is the fact that the weight increments are so large and that several users have mentioned that it is hard to secure the plates before beginning the workout. This single adjustable dumbbell adjusts from 10-50 pounds and is made from heavy duty chrome plated metal. It can be adjusted using a convenient adjustment knob that secures desired weight plates to the dumbbells while leaving other weights behind in the storage tray. Listed for $136, this is an affordable option for individuals who might be looking to purchase a single dumbbell as opposed to a set of two.Many customers have commented on the durability of this product. While other products seem to have issues with the stability of the plates, there have been several reviews of the Bayou Fitness BF-0150 that have said the spring loaded pin system keeps the plates secure. Additionally, this is one of the more affordable single dumbbells on the market. The adjustment increments to this dumbbell come in 10-pound steps, which can be too intense for many individuals. There have also been a few customers who mentioned that with heavy use the adjustment knob needed to be replaced. Make sure to check out the manufacturer's warranty on this product before purchasing to know what is covered. Overall, this is a good single dumbbell to purchase if you are looking to lift no more than 50 pounds of weight. It is durable and easy to adjust, although the weight increases in increments of 10, which might be too much for some users. Make sure always to check the specifics of the product warranty or return policy if there is a malfunction that needs repairing. Stairmaster has created a set of adjustable dumbbells with a new twist lock technology. This features a system that allows users to change the amount of weight by simply twisting the dumbbell handle. Priced at $499 for a set, these dumbbells have a minimum weight of 5 pounds and a maximum weight of 50 pounds each. There are several advantages to owning this set of dumbbells. First, safety technology has made it so that these dumbbells can only be adjusted when properly inserted into their cradle, making accidents less likely to occur. Secondly, the soft grip handles allow you to have a firm grip on the weight, further reducing the likelihood of injury. Finally, the bar of the dumbbell is shorter than average, which leads you to feel more like you are lifting hand weights than giant gym weights. Though there are many advantages to this product, there are a few disadvantages that are worth noting. First, the price of $499 for the set is a significant investment that you will have to decide if you can afford. Though there are more affordable options on the market, make sure that they offer the features that you need in an adjustable dumbbell set. Another potential disadvantage to this dumbbell set is that a few customers have complained about the security of the weights on the dumbbell when in use. Make sure that your weights are secure before beginning your workout to avoid any potential injury. 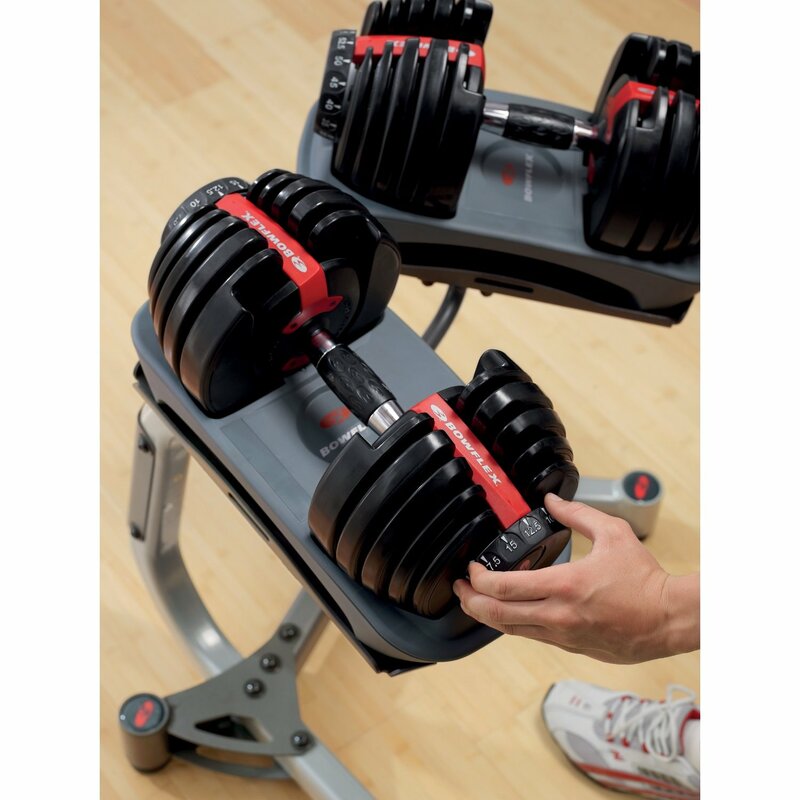 Overall, the Stairmaster Twistlock adjustable dumbbells offer a wide range of weight options in an easy to use format. You will feel like you are lifting a small dumbbell and the soft handles make it easy for you to maintain a good grip while lifting. Make sure to do thorough research before investing in this product, as it is more expensive than the competition. Adjustable dumbbells offer you a total body workout that can be achieved in the comfort of your own home. They are not only convenient but also are cost effective and customizable for your individual fitness needs. Make sure to do thorough research on the type of dumbbell you would like to purchase. Dial-a-weight, spin lock, and pin selector models all have various advantages and disadvantages that you should be aware of. Before making your final purchase be sure to consider the cost, size, maximum weight, and storage options of your dumbbells. Research the main brands thoroughly so that you are confident with your final purchase. Once you purchase your adjustable dumbbell set you will wonder how you ever achieved a total body workout without them!